At 12:25 GMT the Herschel spacecraft was turned off for the last time, ending the operational phase of the mission. The scientific observations had ended on 29th April when the on-board supply of liquid helium was exhausted. But while the spacecraft is no longer operating, there is much work left to do on the data produced by the mission. The spacecraft itselft, however, remained fully operational, and the last few weeks have been spent performing engineering tests on the spacecraft and its instruments, performing procedures which were considered too risky during the scientific phase of the mission. For example the reaction wheels, which control the direction in which the spacecraft is pointing, were pushed beyond their recommended limits, providing useful information for future ESA spacecraft. In mid-May the most of the fuel in the spacecraft was used over the course of several hours, sending Herschel away from its location near L2 and into a slightly larger orbit around the Sun. It now orbits the Sun slightly more slowly than the Earth and will not come close for hundreds of years. 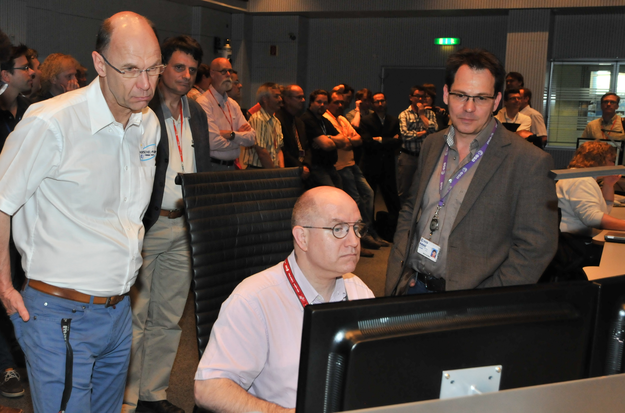 The final commands were sent from ESA's Space Operations Centre (ESOC) in Darmstadt, Germany, and meant that the spacecraft is now permanently turned off. But while the spacecraft will never return any more data, there is much work to be done to study and analyse the three and a half years of scientific data and images. Astronomers using Herschel will spend the next few years ensuring that all the data is in the best state possible, making it as easy to use as possible for future generations of astronomers.